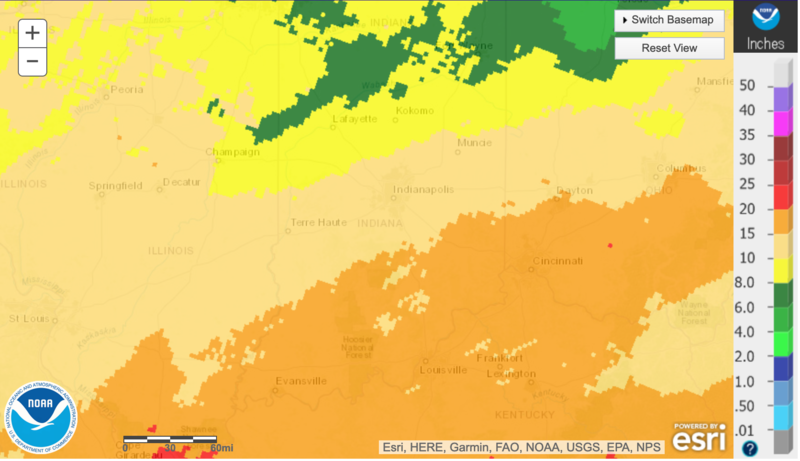 Such periods of intense precipitation will become the new normal for Indiana, according to a report by Purdue University, and they pose environmental threats to delicate ecosystems, agriculture and state park revenue. The National Oceanic and Atmospheric Administration predicts elevated flood risks for two thirds of the U.S., including Indiana. Read more about these risks to the state here. Lashley has been researching weather data from 20 weather stations across Indiana with observation records dating back to 1900. 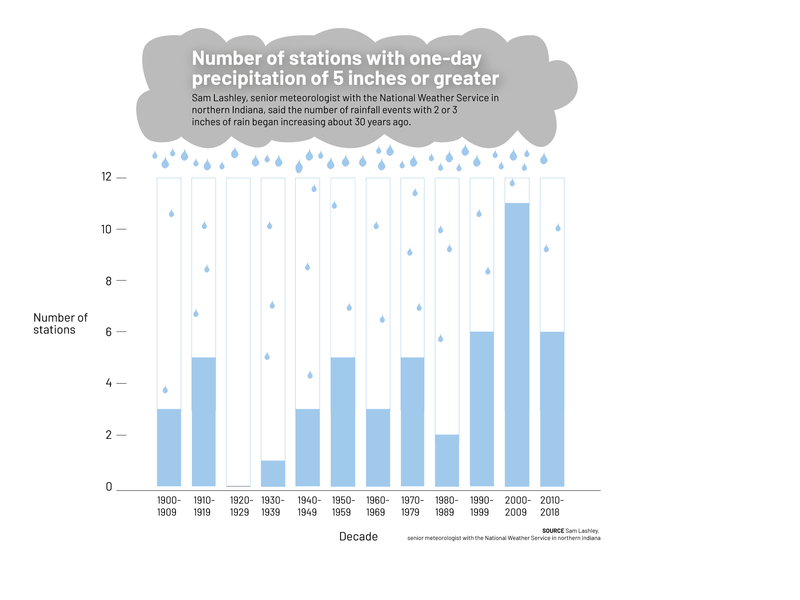 He said the number of heavy rainfall events began increasing about 30 years ago, with the southern third of the state seeing average annual precipitations increase at a rate of 2 inches every 30 years. The Purdue Climate Change Research Center predicted that the southern half of the state will see an increase of volume in rain in the spring and fall, while the north and west will see increases in the summer. The warming of the atmosphere means more water vapor, which leads to more rainfall. Since record keeping began in 1949, the top 50 measurements of water vapor in Indiana in the month of February all occurred after 1990, Lashley said. “We have seen this translate to several heavy rainfall events during February, which is typically our driest month of the year,” he said. This growing amount of water will affect Indiana in a variety of ways. Roughly 1.3 million acres, or about 5.8 percent of the state, is covered by rivers, streams, lakes and wetlands, according to Purdue University’s Aquatic Ecosystems Shifting Climate report. The White River flows through 42 of Indiana’s 92 counties, creating the largest watershed in the state. In the past year, the White River has had seven flooding events across its course. Indiana waterways are home to a variety of wildlife and plants, including reptiles, many varieties of fish and freshwater mussels. All of these ecosystems can be disrupted in heavy rain and flooding events. High water events affect some fish species in a positive way and other species in a negative way, said Indiana Department of Natural Resources spokesman Marty Benson. Other species, such as smallmouth bass, have poor spawning success when flow, turbidity and sediment movement are high, Benson said. 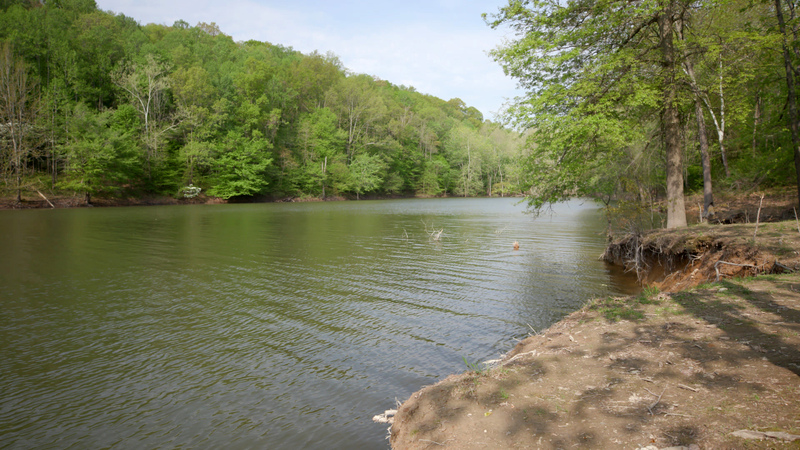 High water levels can lessen aquatic plant growth, which also reduces aquatic habitat. The woods and wetlands along the banks of rivers and streams, known as riparian areas, are also sensitive to environmental change and vulnerable to changing climate conditions. A view along the bank of Lake Monroe, the state's largest inland lake. Increased precipitation and flooding raise the risk of invasive freshwater species, such as Asian carp, spreading to new habitats. The carp need high water events to spawn, and Benson said late May through June flooding typically results in an increase in the Asian carp population. 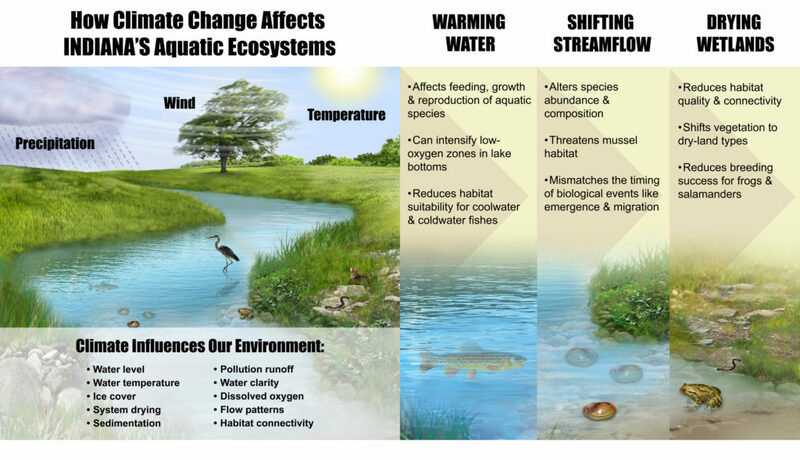 According to the Aquatic Ecosystems Shifting Climate report, changing temperature and precipitation patterns also could promote the spread of an invasive freshwater clam, Corbicula fluminea. The clam can cause damage to water and intake pipes. In addition to shifting precipitation patterns, warmer temperatures also foster an increase in both invasive and native parasites, such as ticks. Larger populations raise the likelihood of movement among animals, including transmission to humans, according to the Aquatic Ecosystems Shifting Climate report. Indiana is known as a top 10 agricultural producer in the U.S., especially in corn and soybeans. According to the Indiana State Agriculture Department, agriculture contributes an estimated $31 billion to the state’s economy, with almost 57,000 farming operations in the state. Heavy rains and flooding events can affect this sector of the economy in many ways. This map from the National Oceanic and Atmospheric Administration details the amount of rain across the state for the past 90 days. According to the Agriculture Climate Change Impact Assessment from Purdue University, heavier rains could increase soil erosion by 17 to 29 percent by mid-century. Shannon Zezula, Indiana State Resource Conservationist with the U.S. Department of Agriculture, said farmers are noticing more soil erosion in areas of their fields that traditionally weren’t prone to erosion, such as lower-lying fields. Also, farmers are mentioning an increase in winter rains from December to March that they don’t remember from the past. “We’ll get a cold spell and then it will turn warmer in rain. So that freeze-thaw cycle on the soil makes it more susceptible, when these rains do come, to it potentially washing away,” Zezula said. The loss of soil also means a loss of productivity and income for the farm and state. Zezula is currently working with farmers to make their soil more resilient by encouraging no tilling, allowing last year’s crop residue to help protect the soil, and planting cover crops. “As we minimize tillage and plant cover crops, the soil starts to become more like a sponge,” Zezula said. The sponge effect and cover crops encourage the soil to hold water, preventing the runoff that occurs on tilled soil in heavy rains. Water recreation contributes more than $1 billion annually to the state’s economy according to the Water and Quality of Life in Indiana report from The Conservation Law Center and INTERA Inc.
Lake Monroe in south central Indiana sees on average 975,000 visitors per year, many of whom are there to fish. But rising rainfall and temperatures could lead to a reduction in the population of fish. 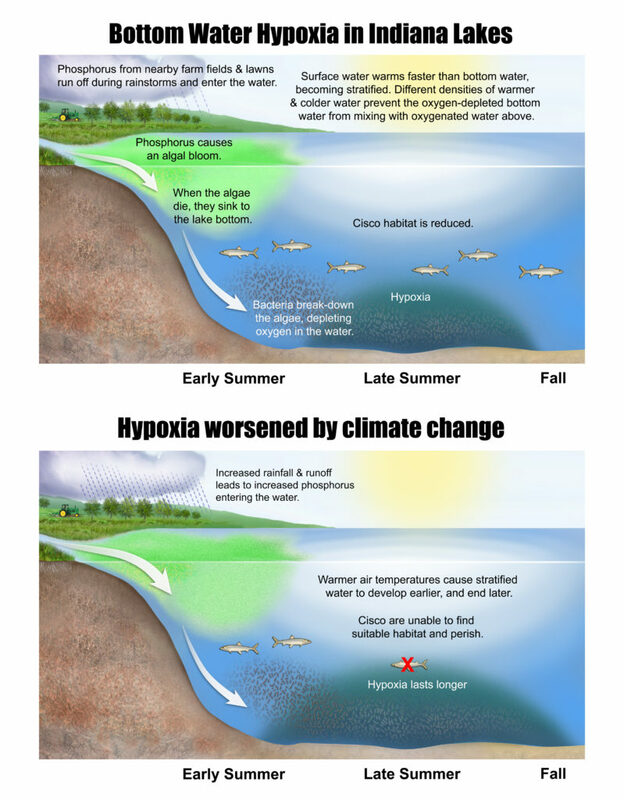 Lake stratification, in which warm surface water and cold bottom water are unable to mix, can lead to a decrease in oxygen levels, killing cold-water fish. This process is expected to begin earlier in the year and last longer in Indiana lakes and reservoirs in response to warming air temperatures and reduced ice cover, according to the Aquatic Ecosystems Shifting Climate report. Warmer temperatures also will allow farmers to plant and fertilize earlier in the spring, when heavier rains are predicted to increase. The combination of early planting and higher spring rainfall in Indiana is expected to lead to more agricultural runoff, which often ends up in streams and lakes. Nutrient runoff, especially phosphorus, during heavy rain events can contribute to an increase in algal blooms, which can be toxic to fish. This past summer, Lake Monroe, the state’s largest inland lake, had a few algae warning days. Exposure to blue-green algae can lead to skin rashes, eye irritation and stomach aches. Heavy rain and flooding also have short-term impacts on visitation in state parks, according to Benson. 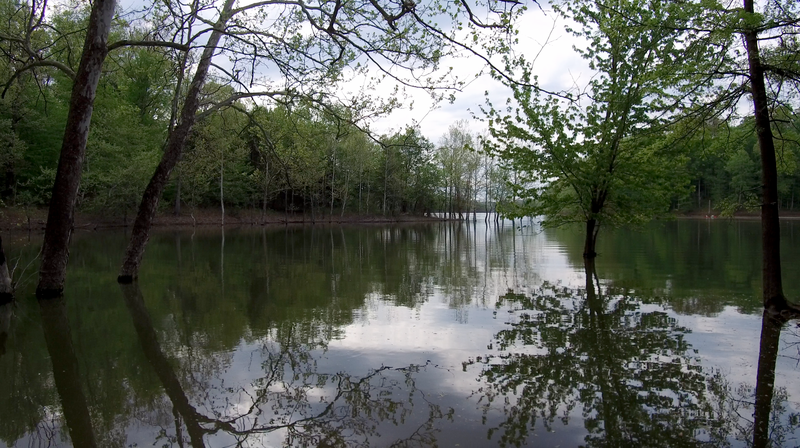 Lake Monroe during a high water event last Spring. Benson said the DNR is encouraging reconnecting floodways with streams so that high waters are able to expand into floodplains, which can be critical to some fish species. The DNR also is promoting farming practices that reduce runoff, and the conversion of highly erodible areas to wildlife habitat. Lashley cautions that people and businesses need to be aware that precipitation is increasing and will continue to increase, and this means more frequent heavy rain/extreme rainfall events. “Mitigation efforts and future planning should take into account the forecast projections and plan accordingly,” he said. 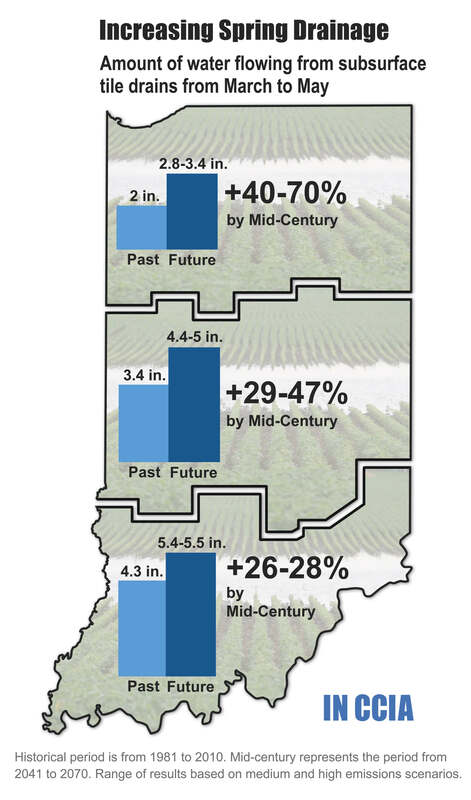 For a closer look at how this year's projected rainfall will affect different aspects of Indiana, click here. In the past two months, Indiana has had three heavy rain events, causing flooding of many of the state’s rivers, lakes and streams. Such periods of intense precipitation will become the new normal for Indiana, according to a report by Purdue University, and they pose environmental threats to delicate ecosystems, agriculture and state park revenue.